As I walked by the stream I heard a low whinny. I whipped my head around and saw a pure white horse. I’m not kidding, that horse was pure white except for a black teardrop shape on its head. I rubbed my eyes with confusion. When I looked again the horse wasn’t there. It just disappeared! I shook my head. I must have been day dreaming. I decided I would have to take Joy next time. I walked on and came to my ramshackle house nestled in the hills, with my mum, dad and my horse Joy. Joy is a dark bay Caspian with a small white dot on her forehead and she is a loving friend. She always kisses me and she responds to my every command. My friend Alana has a horse called Shadow. 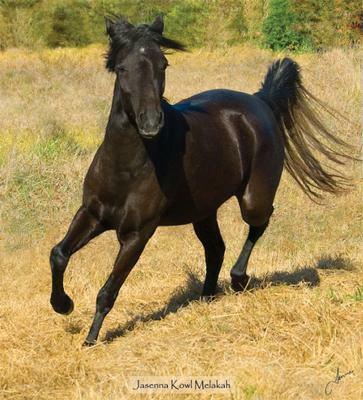 He is a black thoroughbred and he is also Joy’s best friend. As soon as I got home I ran up to my room. I read 2 books and did a jigsaw. “Melody”! I heard my mum call out. “Lunch”! I ran down stairs and surveyed the table. There was a giant bowl of chicken noodles, six bread rolls, and in the oven I smelt a sticky date pudding. I also glimpsed a jar of cream as my dad opened the fridge and got a jar of salsa and a bowl of nachos out. After lunch I ran upstairs and read 1more book when I heard my mum calling me again. I bounded down the stairs taking them two at a time. “Yes mum”? I asked. “Your room is filthy. Go and clean it now please”. I groaned. I really hated cleaning my room. “But…” I started but my mum cut me off. “No buts! You are 12 years old now! You need to learn to be responsible”! I groaned again and ran upstairs. I quickly cleaned my room and ran to the phone. I pounced on it and called Alana. “Hello, Alana Clarke speaking.” “Hi Alana! I was wondering if you would like to go on a trail ride”? “Sure! I’ll be there in 20 minutes”. She said. I hung up and ran downstairs and told my mum. Then I ran to the paddock. Joy was in there prancing around as happy as could be. When I called her name her ears pricked up and she cantered over to the gate. I put a halter on her and led her to the tack room. Then I took the halter off her and put a bridle on her, then a saddle blanket and a saddle. Then I mounted her and trotted down to the trail. I waited for Alana and when she came we started off down the track. The track was long but beautiful. When we were almost at the end we decided to drop in on Mrs Plum who lived near the end of the trail. When we got there, Alana volunteered to go and knock while I tied the horses to a post. After I finished tying them to the post I went to the door. It was open! I walked in and called out. “Alana? Mrs Plum”? Just then as I walked around a corner, a man with brown hair and a slim strong body jumped out and held my mouth so I couldn’t speak. Then he bound my hands and feet and gagged me and pushed me down the stairs to the cellar. I gasped under the gag at what I saw. Alana was there also bound and gagged and another man was holding a pistol. The men tied me and Alana together and a big burly man with a bald head said, “That’ll teach you for trying to mess in our affairs”! Then the man with the brown hair and strong body said, “If only we could capture that meddling Jake!” Then they shut the cellar door and bolted it. Alana and I just sat there in the dark waiting for something to happen but it didn’t. I remembered the horses and almost started crying. What would happen to Joy and Shadow? Can you please write more?